Extend USB 2.0 signals up to 300 feet via Cat5 cables. 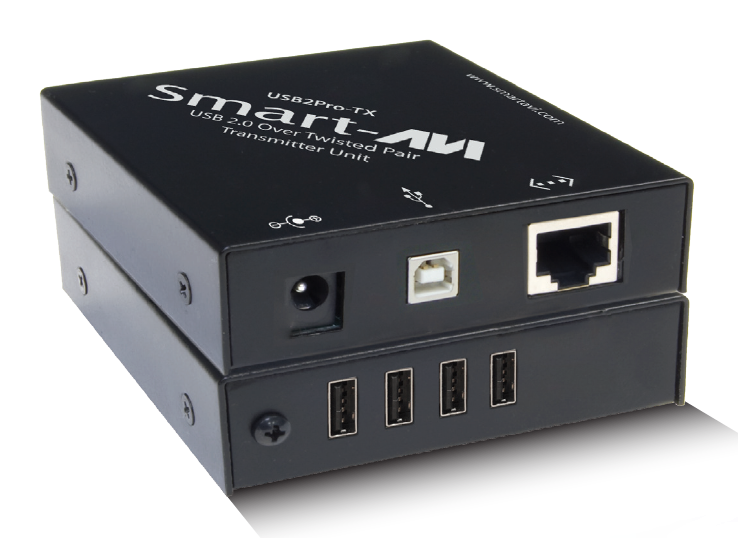 SmartAVI’s USB2Pro extends standard USB (Universal Serial Bus) 2.0 signals up to 300 feet using a single CAT5 cable. The USB2Pro supports all USB 2.0 high-speed devices, from keyboards to digital cameras and will operate on Windows®, Mac and Linux® operating systems. An integrated four-port hub allows for multiple devices to be connected to the USB2Pro at once. Additional USB hubs can be added, increasing the amount of devices that can be plugged into the USB2Pro.